Madonna, Dan Akroyd, Wayne Gretzky and James Maynard Keenan: what do these celebrities have in common? No, they haven’t all dated Paris Hilton. They all own their own wineries and in some cases vineyards. James Maynard Keenan, more commonly referred to as Maynard, is best known as the ultra secretive, artsy and quirky front man of the band TOOL. TOOL is a band that tends to be defined in many different ways because their musical styling can change from album to album but I hope we can all agree that TOOL is a rock band if we can’t all call it a metal band. Maynard is one of the last celebrities I would have expected to move into the world of wine. Yes it is likely because I picture him shirtless with a mohawk, or with long greasy hair, or even just plain old sweaty and disheveled after performing a concert. I think it also doesn’t help that that’s also what most of the other people around me look like when I’m at a TOOL concert. Last year, the reclusive, private rocker put out a DVD on wine and his vineyard called Blood Into Wine. Maynard may have had his inspiration for getting into wine from his grandparents who made wine in Southern France. So it seems, wine may indeed be in Maynard’s blood. According to this great article I stumbled upon, Maynard feels Arizona wine is “Not a business that you can move to Mexico or China. It’s from here. This is the definition of sustainable and local.” Arizona is, as it turns out, a viable and accomodating climate for making wine. Why not use the land for something is what it boils down to. Starting up a vineyard is not a cheap or easy task so I think its wonderful that someone with money can come into an area and start employing the residents. It turns out that Caduceus uses imported California grapes and local Arizona fruit. I had really wanted to try an Arizona wine, so I purchased a bottle of Arizona Stronghold which is the other wine that Maynard has worked on and is a shareholder in. The Arizona Stronghold Nachise is a mixture of grapes but one I would call a syrah. It has a deep fruity flavour, and is not too dry. The label is very appealing as well. When I brought this bottle to a party I felt pretty badass telling people that I was drinking TOOL wine and then going into the details. Everyone wanted to smell the bottle if not have a taste, and no one had anything negative to say. The only issue or concern I had was the price. At approximately $30 a bottle this is as much as I would pay for this, but it does still seem a little pricey. This wine would be something that I would pull out for special occasions. I would be proud to serve this wine to friends of guests of discerning tastes, unlike the Ed Hardy Wine I sampled last summer. 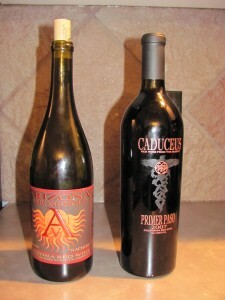 The Caduceus Primer Paso is another fruity mainly syrah mix without too much lingering taste. The wine is smooth and easy drinking and another wine that I really enjoyed. I can definitely see why some wine reviewers have rated it well. My issue with this wine, and the reason I haven’t tried Caduceus Naga is once again the price. At almost $52 a bottle I feel that this wine is more than over priced. I have had similar levels of enjoyment from $15 and $20 bottles. The only reason I would buy this wine again is to try to impress certain people. In all seriousness though, I don’t believe you can impress someone by telling them how much you spent on a bottle of wine. So, if I purchased this bottle, or another flavour it would be for the novelty and even then that is 2/3 of the price for a floor ticket for a TOOL concert and you would have to decide which would last longer or give you more enjoyment. If you have cash to spare I say give either wine a try. If you want to learn more about wine or vineyards that doesn’t go overboard with details and technical terms and even uses humour from time to time Why not watch Blood Into Wine? You should be able to rent it at your local video store, it is available for purchase at liquor stores such as Campbell Liquor store in St. Albert and it’s even on Netflix. So until the next wine the catches my attention come along, bottoms up!